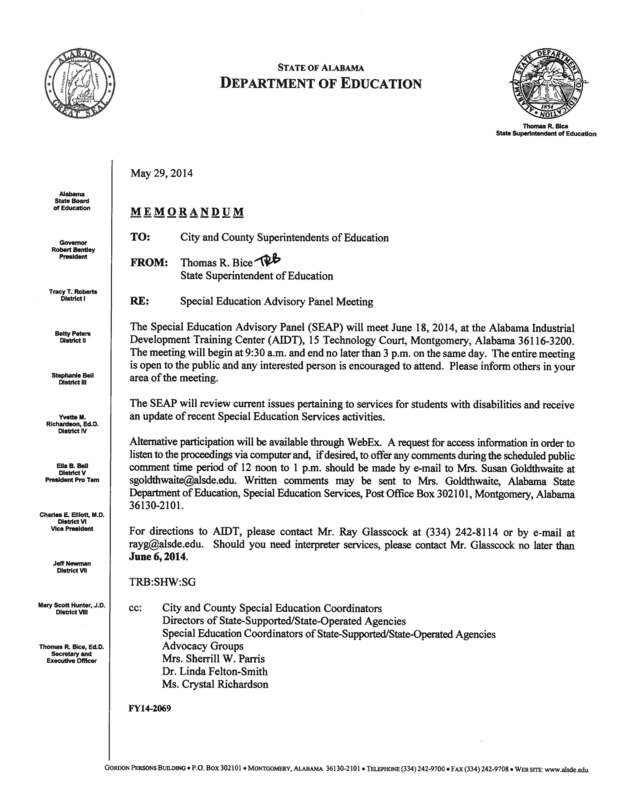 The Special Education Advisory Panel (SEAP) meets on Wednesday, June 18, from 9:30 a.m. to not later than 3:00 p.m. in Montgomery. The public is allowed to comment from 12 noon to 1:00 p.m. There was an opportunity to register to participate via WebEx (online), but that deadline was June 6, 2014. Apologies for not getting this notice online sooner. All notices are shared through the COSEPTA Connections Facebook page. Meeting is held here. All are welcome. Here are the Bylaws governing the SEAP. I will live-blog from the meeting. Janet, my sincere apologies for just now finding your question. The committee members names are not published anywhere. I am attempting to find the names of the SEAP members. I am also attempting to figure out how folks get appointed to the SEAP. The Bylaws state that the state superintendent appoints members for a three-year period, but I can’t figure out how folks get their names in front of the state superintendent….